REGIONAL NEWS - AFRICA 18 E&MJ • JANUARY 2018 www.e-mj.com industry, now in its twilight years. Ra- maphosa may well be the man to return South African mining to its place on the world stage. The chambers' Baxter said that should Ramaphosa bring mining and govern- ment back together, both would derive mutual benefit. "Not only would this result in a sig- nificant growth in annual investment, but there would be a sizable increase in jobs, export earnings, GDP and, importantly, transformation," Baxter said. SMB-Winning Unveils a Major Alumina Project for Guinea The SMB-Winning consortium presented a $3 billion project to Alpha Condé, president of the Republic of Guinea, to build an alu- mina refinery in Guinea as well as a railway to open up the Boffa corridor to carry baux- ite to the refinery and the Dapilon river port. The feasibility and social and environ- mental impact studies will be carried in 2018 with a goal of starting construction in 2019. This is an ambitious plan for the Boké region and it will contribute to Guinea's continued economic and social development, explained Frédéric Bouz- igues, managing director, SMB. "The local processing of raw materials is one of the biggest challenges for a more inclusive growth in Africa because it cre- ates more value locally while leading to economic diversification," said Fadi Waz- ni, chairman, SMB. "This commitment to Guinea also demonstrates our confi- dence in the continued improvement of both its business environment and mac- roeconomic stability." Founded in 2014, the consortium con- sists of Société Minière de Boké (SMB or the Boké Mining Co.); Winning Shipping, one of Asia's largest carriers based in Sin- gapore; UMS International Ltd., a trans- port and logistics leader in West Africa; Shandong Weiqiao, China's leading alumi- num company; and the state of Guinea. Sibanye-Stillwater Set to Acquire Lonmin Sibanye-Stillwater and Lonmin have agreed to an all-share takeover offer of Lonmin by Sibanye-Stillwater that values Lonmin at about £285 million ($382 million). If fully realized, the agreement will combine Sibanye-Stillwater platinum group metals (PGM) assets in South Afri- ca with Lonmin's contiguous operations, which include downstream processing facilities, and allow Sibanye-Stillwater to become a fully integrated PGM producer in South Africa. Sibanye-Stillwater currently produces about 1.7 million ounces per year (oz/y) of PGMs, including production from its Still- water operations in Montana, USA. Com- pletion of the transaction will increase this total to about 2.8 million oz/y. 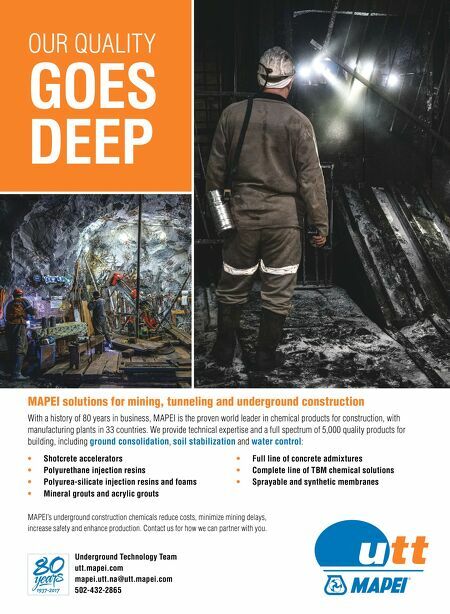 Among other benefits to be gained from the transaction, the combined company will be able to mine through existing mine boundaries between Sibanye-Stillwater and Lonmin operations in South Africa, allowing for the optimiza- tion of ore extraction in these areas, and it will be able to make optimal use of surface infrastructure, including concentrators, tailings deposition facilities, and training and engineering infrastructure. Following completion of the acquisition, Lonmin shareholders will hold approximate- ly 11.3% of the enlarged Sibanye-Stillwa- ter group. Completion of the transaction is planned for the second half of 2018. "The proposed combination with Lon- min positions the enlarged Sibanye-Still- water group as a leading mine-to-mar- ket producer of PGMs in South Africa," Sibanye-Stillwater CEO Neal Froneman said. "The realization of significant syn- ergies between the operations, which will deliver longer-term benefits for all stake- holders of both companies, is expected to result in this being a value accretive trans- action for Sibanye-Stillwater shareholders. "The flexibility inherent in the larger regional PGM footprint will create a more robust business, better able to withstand volatile PGM prices and exchange rates. Furthermore, the sizeable combined re- source base, with its pipeline of advanced and early stage projects, also offers signif- icant growth and value upside potential under appropriate economic and market circumstances." 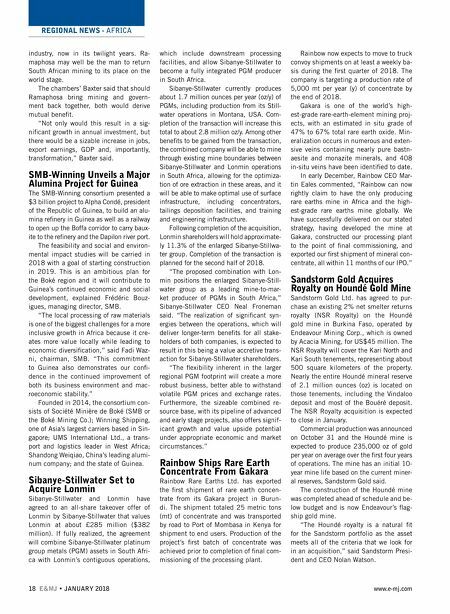 Rainbow Ships Rare Earth Concentrate From Gakara Rainbow Rare Earths Ltd. has exported the first shipment of rare earth concen- trate from its Gakara project in Burun- di. The shipment totaled 25 metric tons (mt) of concentrate and was transported by road to Port of Mombasa in Kenya for shipment to end users. Production of the project's first batch of concentrate was achieved prior to completion of final com- missioning of the processing plant. Rainbow now expects to move to truck convoy shipments on at least a weekly ba- sis during the first quarter of 2018. The company is targeting a production rate of 5,000 mt per year (y) of concentrate by the end of 2018. Gakara is one of the world's high- est-grade rare-earth-element mining proj- ects, with an estimated in situ grade of 47% to 67% total rare earth oxide. Min- eralization occurs in numerous and exten- sive veins containing nearly pure bastn- aesite and monazite minerals, and 408 in-situ veins have been identified to date. In early December, Rainbow CEO Mar- tin Eales commented, "Rainbow can now rightly claim to have the only producing rare earths mine in Africa and the high- est-grade rare earths mine globally. We have successfully delivered on our stated strategy, having developed the mine at Gakara, constructed our processing plant to the point of final commissioning, and exported our first shipment of mineral con- centrate, all within 11 months of our IPO." Sandstorm Gold Acquires Royalty on Houndé Gold Mine Sandstorm Gold Ltd. has agreed to pur- chase an existing 2% net smelter returns royalty (NSR Royalty) on the Houndé gold mine in Burkina Faso, operated by Endeavour Mining Corp., which is owned by Acacia Mining, for US$45 million. The NSR Royalty will cover the Kari North and Kari South tenements, representing about 500 square kilometers of the property. Nearly the entire Houndé mineral reserve of 2.1 million ounces (oz) is located on those tenements, including the Vindaloo deposit and most of the Bouéré deposit. The NSR Royalty acquisition is expected to close in January. Commercial production was announced on October 31 and the Houndé mine is expected to produce 235,000 oz of gold per year on average over the first four years of operations. The mine has an initial 10- year mine life based on the current miner- al reserves, Sandstorm Gold said. The construction of the Houndé mine was completed ahead of schedule and be- low budget and is now Endeavour's flag- ship gold mine. "The Houndé royalty is a natural fit for the Sandstorm portfolio as the asset meets all of the criteria that we look for in an acquisition," said Sandstorm Presi- dent and CEO Nolan Watson.